Soviet LTM lenses which do not focus or couple correctly have been mentioned in a lot of posts. 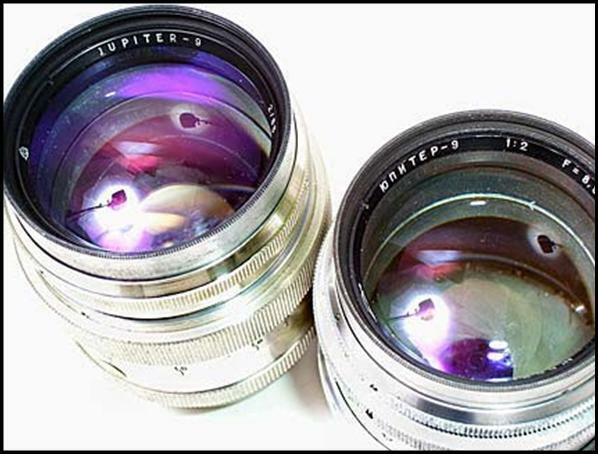 The wide aperture short tele Jupiter 9 (85mm f:2) lens figures in many of them. I've spent some (or a lot?) of time lately trying to figure out why the two J-9 LTM here are not coupling properly and unable to focus correctly at minimum distance settings. The J-9 I've got also did not focus correctly initially, but this fault was qickly fixed. The LTM version is more complicated. Assuming that the optical block is intact (ie, no misaligned or mismounted elements, correct spacing, etc), focus errors can be due to incorrect lens working distances. The optical blocks from the LTM and Contax mount types can interchange with one another. A seller could replace a bad optical block of a lens with a good focussing block with that of another to come up with a pristine specimen which would be more marketable. Or else, optical blocks can be mixed up between several similar lenses if many of the same type are being serviced. lifted off an LTM J-9. A suspect lens which shows correct infinity focus on a ground glass screen on the camera's focal plane will not guarantee that the lens will focus correctly at other distances, even if the camera's RF would correctly measure infinity focus. This is where the bugs come in. At middle to minimum focus ranges, the focus will not coincide with the camera RF or perhaps the distance scale engraved on the lens barrel. Incorrect reassembly after CLA is likely the reason for this bug. The J-9 has three barrels- one to move the lens for focussing, another to move the focus cam (the "barrel-shaped" rf coupler) , and a third one between these two which appears to "translate" the focus helical's movement into correct cam movement. Unlike the Industar 22/50 lenses where the focus movement would directly determine how much the rf cam coupler is pushed out, the J-9 (and likely, the other Jupiters as well) has a separate focus block which needs an intermediate mechanism to link the focus movement to the cam movement. Again, many of these ancient lenses would have to cleaned and lubricated to make them move smoothly before they are sold. To lubricate the J-9, its three helicals need to be disassembled to flush out the old grease and apply the new one. All the helicals have multi-entry threads, and it is very easy to have them installed back incorrectly. There is no way of telling immediately whether the helicals are correctly installed or if the lens will couple with the camera rf and focus correctly. Correct reassembly should have the focus cam pushed out to about 7.51mm (at infinity) and about 5.8mm (at < 1.15m focus) from the face of the lens mounting flange. [*The figures were measured from the cam lengths of an Elmar 90, a Serenar 85, and a proven Jupiter 8 for comparison*]. have to be installed correctly in relation to each other. epilogue: I like the J-9 so much that I now have 14 of them in the four more common mounts (LTM 39, Kiev RF, Zenit TM 39, and Zenit TM 42).